Russia plans to supply the Syrian government with at least 10 MIG-29 M/M2 fighter jets, MIG corporation CEO Sergei Korotkov said on Friday. “The Syrian delegation is in Moscow now, and the details of the contract are now being determined,” Korotkov told reporters. MIG-29 M/M2 is a multi-purpose fighter jet, which could be used as both anti-aircraft interceptor and a bomber. Korotkov’s remarks came days after Moscow said it would ship to the Syrian army S-300 air defense missile systems later this year. Syria signed a contract for the jets in 2007, but the outbreak of the civil war in Syria in 2011 prompted the plane maker to put a deal to deliver 24 MiG-29MM fighter jets on hold, a MiG representative told RIA Novosti on condition of anonymity. The $1 billion deal included 24 MiG-29s, as well as five MiG-31 interceptors, Kommersant daily said in 2007. The head of the Russian state arms export monopoly Rosoboronexport, Anatoly Isaikin, denied the MiG-31 deal in 2010, but did not mention the MiG-29 contract. The Syrian Air Force in Moscow is revisiting the deal ahead of the expiry of the European arms embargo against Syria, the MiG representative said. However, Kremlin aide Yuri Ushakov said on Friday that Russia was not going to sign any new military contracts with Damascus. Ushakov declined to comment on reports that a first shipment of the S-300 missiles had already been delivered to Syria. With the European Union (EU) lifting its arms embargo for the Syrian opposition, the war-torn country may become a testing ground for Russian and Western arms, a Moscow expert said. “Every armed conflict in the world may become a military testing ground,” Nikolai Poroskov, a retired colonel and ex-editor of the Russian Defense Ministry’s daily Krasnaya Zvezda, told Xinhua. He says Moscow has been honest when insisting Russia will supply Syrian President Bashar al-Assad’s government with defensive weapons only. “All weaponry Russia delivers to Syria are defensive, be it S-300, MIG interceptors or Yahont anti-ship coastal missiles,” the expert said. “So I guess the EU would supply the rebels with such arms,” Poroskov said. The Russian Foreign Ministry said EU’s lifting of arms embargo “directly harms the prospects of convening an international conference on Syria,” while Washington slammed Moscow’s shipment of S-300 as provocative. Earlier, Russian Foreign Minister Sergei Lavrow denounced the EU move to arm Syrian rebels as illegitimate and violating international law. 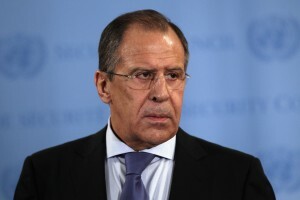 “Discussing at an official level whether or not to supply arms to non-state subjects is in conflict with all norms of international law, including the principles of non-interference in states’ internal affairs, not to mention military intervention,” Lavrov said. The international conference on Syria, initiated by Russia and the United States, is expected to be held in Geneva next month. The Syrian National Coalition (SNC), the main umbrella Syrian opposition group in exile, has refused to participate in the talks.